It takes a while to figure out the public transport in every new place. For those who are familiar with peak hour conditions of QQLand public transportation, can be a very big challenge. So it's the taxi service, in the interim, to get around. I am putting up at a friend's place (rent free) but it is a wee bit far away from my office. For now, cab fare getting to work and back is about RMB 50 (SGD 10) each way. Multiply that by 26 wucking days, it's a rather hefty RMB 1300 (about SGD 260) a month. Still relatively cheap by Singapore standard but lest you be reminded, I am not in Singapore. I was late the first day of getting to work on my own. I was waiting for cab at the wrong places. They were either occupied or heading in the wrong direction. 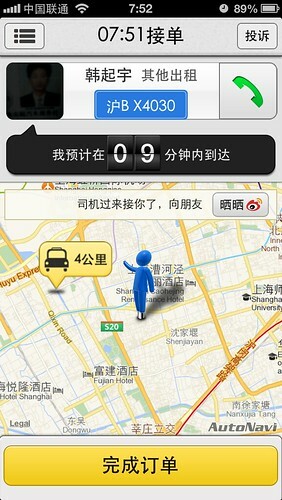 I did a search for taxi service apps for the mobile phone and discover there were many. I downloaded them all and tried then all. None of them worked, as I was not able to secure a single successful booking. Getting home from work is even worse as it is damn ulu to begin with. That was until I discovered 大黄蜂 (literal translation: Big Yellow Hornet). I started to notice the few cabs that I took had their mobile phones mounted on their dashboard with this app on their screen. I had a good chat with the drivers and realised quite a large number of cabbies uses this app. This new app is rather popular among the cabbies due to their generous subsidies to the cabbies. I think it is good strategy to encourage adoption rate as long as the software developer has enough start-up capital to sustain the initial burn. Unlike our Comfort-Delgro app which is run by the taxi company i.e. a surcharge imposed, this one is very much like Tan Kin Lian's Taxi Automated Booking System (TABS), which I suspect is defunct as I can't find it anywhere on Apple Appstore. It is an independent software linking up cabs and passengers, bypassing the taxi company. Like TABS, there is also the option to add tips to entice the cabbies to take up your fare ahead of other passengers, especially during peak hours. The downside, especially during peak hours, is that you need to book a little in advance as the wait for the taxi to actually show up is about 20 minutes. If you need a cab right away, it is better to just stand out there on the street and try to flag one down. Again, you will need to figure where to wait for the cab. Payment for me is via their EZLink card which is very good in the sense you don't have to deal with pesky change after you paid your fare. Always, take the receipt regardless if you need it or not. I made the mistake of not taking the receipt and the cabbie made off with my iPhone when I carelessly dropped it. It was totally my fault as I let my guard down since Shanghai and Beijing are so much safer than cowboy town D0ngguan. As the saying goes, low crime doesn't mean no crime. Malaysia we have two taxi apps. one is better than the other because not much fuss. the other too fussy to be even start using. doesn't matter as the first one already has enough taxis in their stable. Naeboo: care to share what is the name of that app? I have need it the next time I head to KL. this app is KL exclusive or all-Malaysia?